NISHINOMIYA, Hyogo Prefecture The Asahi --Koshien Stadium has seen its share of thrilling comebacks and inexplicable errors, so it's no surprise that the pressure at the hallowed grounds even got to former New York Yankees slugger Hideki Matsui. 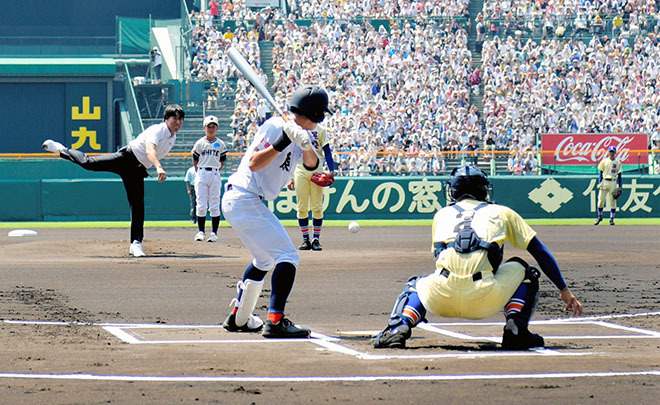 To commemorate the centennial version of the National High School Baseball Championship, which began on Aug. 5, Matsui was chosen to throw out the ceremonial first pitch before the first game. Matsui was known as a cool competitor in the major leagues, where he was named World Series MVP when he led the Yankees to a six-game triumph over the Philadelphia Phillies in 2009. But standing on the mound before a capacity crowd at Koshien may have rattled him. Matsui's pitch sailed low and in the dirt, not something usually seen by a former major leaguer in the ceremonial toss. After the ceremony, Matsui told reporters, "I had planned to deliver the pitch right down the middle, but I came under the strange power of Koshien." Matsui was chosen to throw out the first pitch because he had a stellar three years at the national tournament when he played for Seiryo High School of Ishikawa Prefecture. As a special gesture for the 100th anniversary of the annual tournament, a different "legend" from the Koshien history books will throw out the first pitch before each first game of the scheduled 17-day tournament. In an ironic twist, Matsui threw his pitch to a catcher from his alma mater because Seiryo drew the first game of the first day of the tournament in the random draw to decide the matchups. A record 56 schools are participating in the 100th championship. Normally, 49 schools from the 47 prefectures of Japan compete in the tournament. Forty minutes after the stands were opened to spectators, a notice was posted saying a capacity crowd had been reached. That was more than an hour before the start of the opening ceremony. Among those attending was Crown Prince Naruhito and Crown Princess Masako. Naruhito delivered an address for the special occasion. He attended two previous opening ceremonies, while it was the first for Masako.